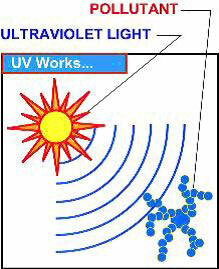 UV Light is naturally occurring! Ultraviolet Germicidal Light is a trusted air purifying method used in hospitals nationwide, and ultraviolet energy is the suns rays that naturally purifies the outside air. Ultraviolet lamps enable the Electro Breeze UV air cleaner to produce the natural germicidal rays that kill germs and control allergens. Mold is probably the most common bio-aerosol. Germs are also known as bio-aerosols or pathogens. Bio-aerosols are airborne pathogens, such as bacteria, viruses, fungi, mold and mildew, (micro-organisms), which cause infectious disease. They can cause allergic reactions, asthma and other respiratory ailments. Indoor air pollution also includes VOC's, (volatile organic compounds), and other toxins which are gases. They can trigger allergies, various health problems, and may cause odors. Basic Facts and Research Regarding Ultraviolet Energy or UV Light. The Electro Breeze UV whole house air cleaners design is based on accumulated research data and actual experience from Westinghouse Electric Corporation Lamp Division's research laboratories. All ultraviolet energy is measured in nanometers and the wavelengths are shorter than visible light. Therefore UV energy is invisible to the human eye. The wavelengths of ultraviolet generated by the Electro Breeze UV whole house air cleaners germicidal lamp are in the 254 nm. range, making them lethal to the bio-aerosols described above. A single UV lamp will provide a kill rate of 70% to 85% at 1500 cfm with this lamp positioning. 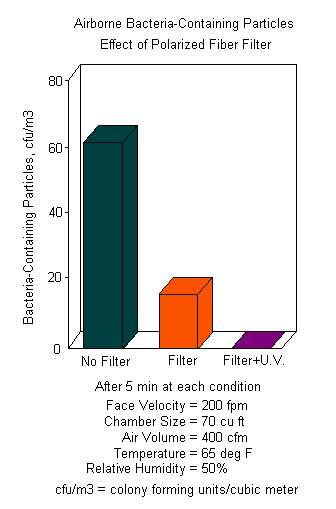 The germs that escape on the first exposure will be hit again and again until they are destroyed as the airflow carries them through the UV radiation. The kill rate achieved by other manufacturers lamps may be more or less than Electro Breeze. The kill zone of the germicidal lamp is within 2 inches of the lamp. A kill rate of 99% is achieved at this distance. The effective zone is up to 24 inches from the lamp. Within that distance, a microorganism may not be killed, but single-pass exposure to the ultraviolet energy (within 24 inches of the lamp), will disturb its DNA (reproductive code) and stop if from reproducing and infecting us with disease or illness. Many microorganisms travel through the air. Carried by the air stream or by attaching themselves to water droplets, they are intermixed with particles in the air. This can create a shadowing effect when the microorganism passes by an ultraviolet lamp, protecting it from the lamp's rays. Therefore, it is best to also have a high efficiency electronic filter in your furnace to control the particulate in the air, thus preventing or minimizing the shadowing effect. There is no controversy about ultra-violet germicidal lamps being the most effective course of destroying micro-organisms, but the lamp cannot remove the particles that are often the host for viruses and bacteria. The high efficiency of the Electro Breeze air cleaner makes it a perfect match for capturing and killing spores, viruses, allergens, dust, pollen, dust mites, cockroach feces and more.